I first heard about this book when Heather from Capricious Reader was raving about it, as she read it, on Twitter. Based purely on what she was saying about it while she was reading it I requested it from the library, and waited and waited. Having finally come in I have now renewed it a couple of times, but it was down to the wire - I either had to return it unread or read it. I decided on the latter, and I have to say I really wish I had of read it before now! I am only 60 pages in, but I already love it, and will be putting in my request for Natasha Solomons next book as soon as it appears on the library catalogue. There remained one more item on Jack's list. He knew it to be the quintessential characteristic of the true English gentleman and without it he was nothing. Item one hundred and fifty: An Englishman must be a member of a golf club. I am going to cheat a little bit and give two more sentences from page 63, as it amused me when I read it, and I think it gives a glimpse of the humour and charm of the novel. I am pretty sure that I am going to find plenty more quote worthy passages as I finish reading the book. "My mother warned me that craziness ran in your family. I should have listened but no, I was young and foolish, and easily impressed by your red bicycle and your thick hair." 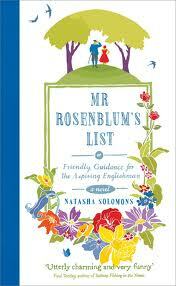 This book is also published under the title Mr. Rosenblum Dreams in English in the US. They're both great teasers. I never knew an Englishman had so many qualities. Thanks for visiting me. Thanks for stopping by my blog! Awesome teasers! Seems like a really fun book! At least both of these little snippepts made me laugh, if the book is as good as these teasers you've really got something there! Here's our teaser for the week. I saw this at Borders yesterday (might have been on the 3 for 2 pile) and picked it up- looked good. Glad you're enjoying it- I like the second teaser! I like your teasers, sounds like a funny book. I really enjoyed this book as well. Thanks for visiting my blog, How to make Gravy is worth a look! I too got curious about this one after HEather talked about it. I love both your teasers. The second one made me laugh out loud. I love the second one! I'm glad you're enjoying it. I hadn't heard of it before but I will definitely look it up. Thanks for visiting my teaser! Totally loving that second teaser --- I'm going to have to track down this book, myself! Thanks for stopping by my blog, The Enchanted Book. Funny teasers :) I wonder if the book is as funny as both teaser or is it more serious. Sounds like a fun book. Goo Choice. Oh my gosh! I just cracked up at that second quote, and am going to be adding this book to my list. What a fun and funny book! Thanks for sharing it! My grandfather was highly English, since he was born in Bolton. I don't remember him having a Golf Club membership, in fact he hated Golf. He was still an Englishman though. Haha I love the second one. Cute teasers! Mine is at The Crowded Leaf. Sounds like a delightful read. I hope you enjoy the rest of it! The teasers have quite the dry wit. I can see why you are getting in to it. Oh I love a good witty teaser and these are great!! Totally chuckling to myself! Thanks for sharing and thanksfor dropping by my blog too! They both made me laugh, especially the second one! Sounds like a book I should check out. I am tickled to death that you are enjoying Mr. Rosenblum. I adore Jack and Sadie so much. I remember that second quote, it was one I made a note of myself! It made me laugh out loud. Both these teasers are fantastic! I'n certainly intrigued about this book and off to check it out! Oooh I like and thanks for the bonus teaser! Those are great teasers, I will have be on the look out for that one, you can't beat English humor! After reading your teasers, I think I would love the writing in this book! I'm always in favor of bonus teasers, as the more bits I can read of a book, the better sense I get of it. I can't wait to hear your thoughts when you finish the book! Great teasers!!! Made me laugh, which is always a good sign! hope you are enjoying it so far!! Miss Page-Turner, rule no. 1 is "Spend your time immediately in learning the English language"
Erin, this book is really good so far, so wouldn't hesitate to recommend that you add it to your TBR list. Heather, I only wish I had of read it earlier! Novroz, I would say that it is both funny and charming, so these aren't the only fun moments in the book. Beth F, read it! read it! Thank you to everyone for stopping by!